Keep your food and drinks chilled in the Igloo 60 qt Ice Cube Roller Cooler. It's simple to transport and features a telescoping, locking handle that is easy to grip. This Igloo rolling cooler has a recessed drain plug that's designed for ease in emptying melted ice and cleaning. It also features molded side handles that allow for comfortable carrying and lifting. 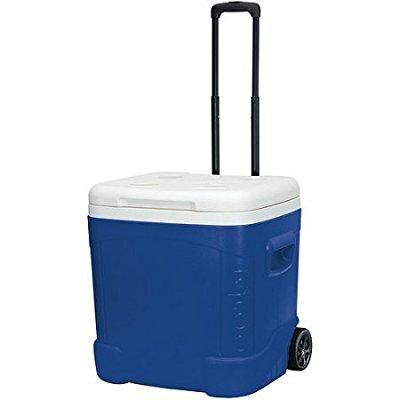 This blue cooler is able to hold up to 90 cans on the inside so you can keep an entire party stocked with various beverages. It has two wheels for easily rolling to your destination. This unit also has four drink holders on the lid so you can rest cans on the top. It's ideal for use while tailgating, at family barbecues and camping. OMG it's really a great cooler. It does hold a lot and the height of the handle is good for tall people. My first cube cooler as opposed to standard size. I love this cooler. It is taller than regular coolers so it makes more room when traveling. Plenty of space inside. Finally able to put milk in a cooler without the hassel of the lid not closing. Has wheels for easy handling and cup holders on top. Purchased this cooler to store soda in for a high school reunion. It holds 90 cans of soda plus ice and keeps it cold for two days. It is sturdy, easy to manuver, and allows for clear view of contents. The only issue is that is is too tall to fit easily in the trunk and had to be placed on back seat to take to the event. well, it works. we had one just like it a couple years ago and it was great, worked well but we left it outside too long and it got too yucky so we threw it out and ordered another because the price is reasonable. the handle and wheels are very convenient and it's easy to move around. we filled it with ice and water bottles and juice pouches at my son's birthday party and it sat in direct sun for hours and kept them cold all day. in fact, it set outside for a couple days after and there was still ice in it until around day 3. The cooler itself has a lot of space, the descriptions said 90 cans and that is accurate. The main reason I made this purchase was the handle and wheels and it rolls perfectly smooth and the handle is long enough to accommodate me and I am 6 feet tall.